Dry Eye Products | Blue River Medical, Inc. 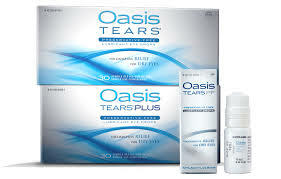 The active ingredient in Oasis TEARS is glycerin, which works by interacting with both the water and oily layers in the tear film, and holds them on the surface of the eye. The glycerin combines with a special, highly elastic substance to keep tears on the eye surface for a long time. When the eyelids close, the Oasis TEARS solution spreads out and distributes glycerin and water to moisten and lubricate the eye surface. When the eyelids open, the solution reforms and recaptures the glycerin and water, holding it for repeated releases with each blink. The unique combination of glycerin and the special elastic substance lubricates and moisturizes the surface of the eye for instant comfort. With each blink of the eye, Oasis TEARS coats and re-lubricates to provide long-lasting relief from dry eye.